My friend from Taipei is back in town, again, and we decided to get together with a couple of old friends of mine. Many, many moons ago, Rice was the one who first told me about a Taiwanese lady living in Paris who is very knowledgeable about wine, and it took a pretty long time for the three of us to finally sit down at the same table. The request was for a bistro. Unfortunately it was a little late to book a table at ON Dining Kitchen and Lounge, so I got ourselves a table at sister restaurant Upper Modern Bistro instead. It's been a while since I last showed this place some love (since I've been spending my time at ON), and it's always good to revisit and check up on the place. I arrived a little late thanks to a work emergency, and my friends had already opened the bottles of wine they had brought. Suddenly I realized that I brought along a couple of cheapies... but I guess I'll have other chances to make up for it. I left the ordering up to the others, and we ended up going through a lot of starters. Lentil hummus, croûtons - this was pretty nice and smooth, almost airy. Loved it with the salmon roe. Foie gras crème brûlée, poppy seed - what's not to love about foie gras that's made into a crème brûlée, which is like two kinds of awesome in one?! So smooth and creamy. Sea urchins, lobster, cauliflower, fennel - I only got a little bit of this. The lobster was OK, but I loved the orange citrus sauce. Crispy squid, black sesame and lime dip - deep-fried squid coated in crunchy batter? Yes, please! Cold cuts, tomato salsa, toast - the platter came with cooked jamón serrano, chorizo, prosciutto, jamón ibérico, and cecina. 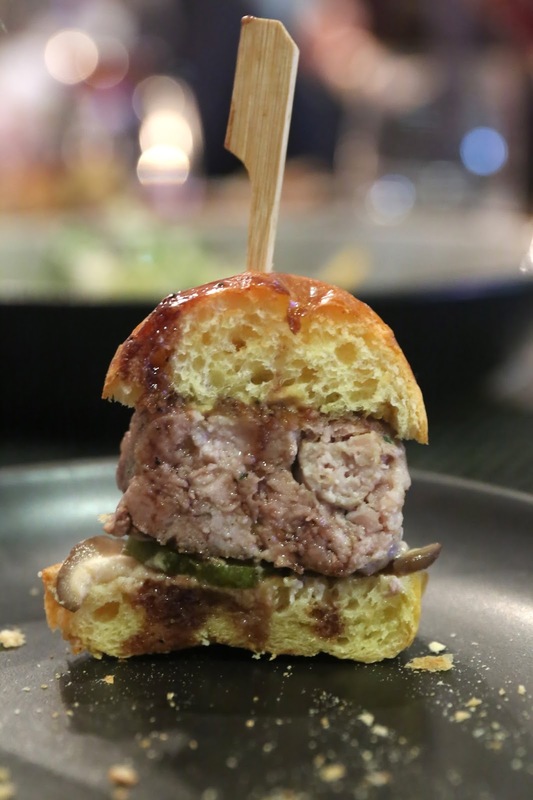 Mini veal burgers, mushroom purée - the mushroom purée was pretty nice. A pretty big mouthful, but pretty satisfying. Caramelized octopus, white miso, mixed herbs - nice texture, somewhere between chewy and soft. The miso was tasty, and interestingly the dish came with a brunoise of potatoes. Prime beef tartare, Avruga, oyster dressing, raifort and herb granité - not bad at all, especially the mix with oysters and Avruga. Pretty AND tasty. Confit Iberico pork cheek, tandoori and orange, spätzle and baby carrots - there is probably no universe in which I would not enjoy pork cheek, especially when it comes with a tandoori and orange jus. The spätzle was OK, but I think I was the only one who touched it. Pigeon and foie gras pie, lentil sauce - this is a dish that I'm familiar with, having had it at ON Dining Kitchen. It's pretty heavy, so I'm glad we shared it among us. Just looove the rich mix of foie and diced pigeon. I guess it kinda makes up for the lack of any grilled pigeon on the menu. Brillat-Savarin fermier - still as creamy and melt-in-your-mouth as ever. Vacheron Mont d'Or - we asked for a "fresh" one, and it was nice and ripe. Époisses de Bourgogne au lait cru - not many of these producers left. Besides good food and fantastic French cheese, we also had some good wines tonight. As it turns out, we went through 5 different regions in France, with a Cali thrown in... Even though he wasn't here and I never told him that I was coming, somehow Jeremy managed to leave instructions to waive the corkage for us. 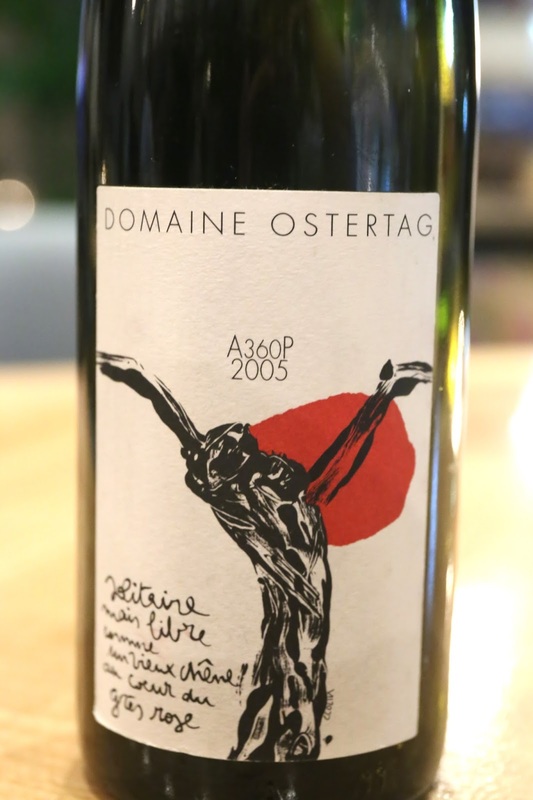 2005 Ostertag Pinot Gris Muenchberg A360P - a little mineral, a little fruity, with stone fruit notes. A little ripe and sweet on the palate, but more dry than I expected. 2000 Rayas - first pour was disappointingly dirty and chalky. Turns out it was a dirty glass. Second pour into a new glass showed more animal notes. After 2½ hours it finally opened up, showing good fruit and a little violet, along with a little sharp alcohol. Pretty good, but not nearly as stunning as the ex-domaine bottle I drank 4 weeks ago. 2004 Domaine Leroy Vosne-Romanée - opened for more than 2 hours without decanting. A little leather, nice and sweet, ripe fruit, with plenty of toast in the nose. Soooo fragrant. A little acidity comes out at the end. Just about as good as the bottle I had last week. 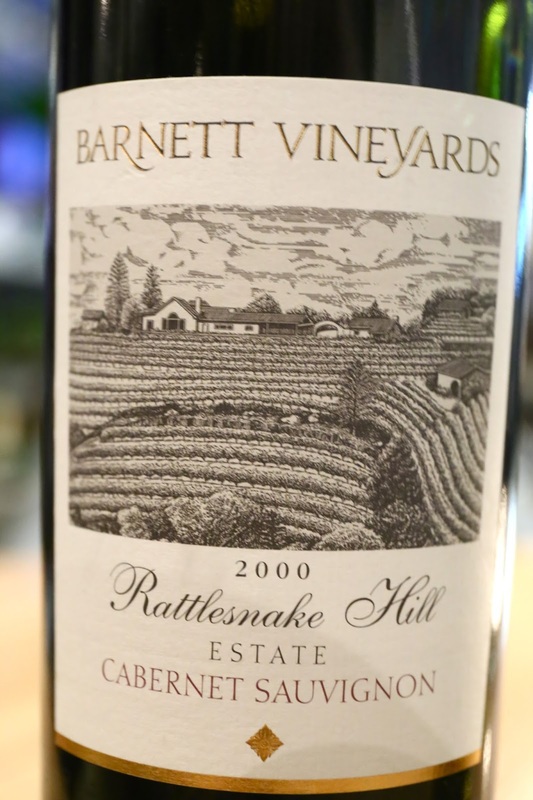 2000 Barnett Cabernet Sauvignon Rattlesnake Hill - very vanilla, oaky, minty, lots of coconut butter, along with some pencil lead. Drinking very nicely now. 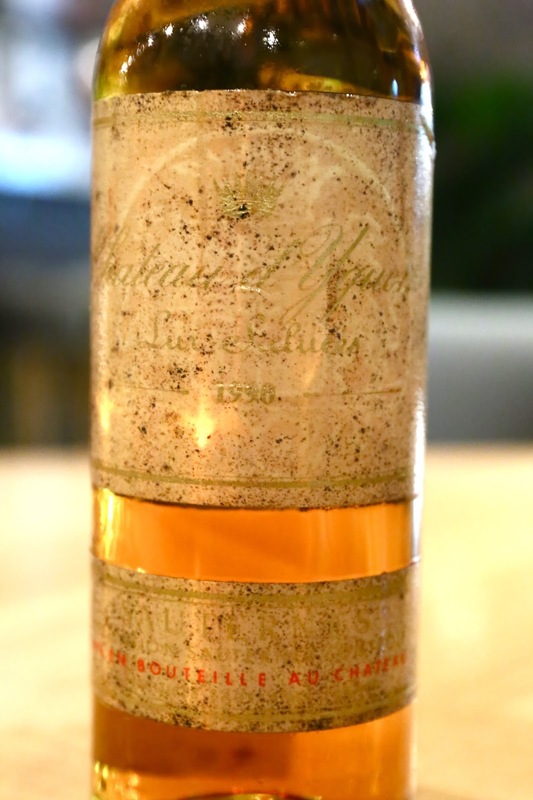 1990 Yquem, en demi-bouteille - a little wax, marzipan, a little marmalade, acetone. Obviously very sweet. Viscous. Beautiful. 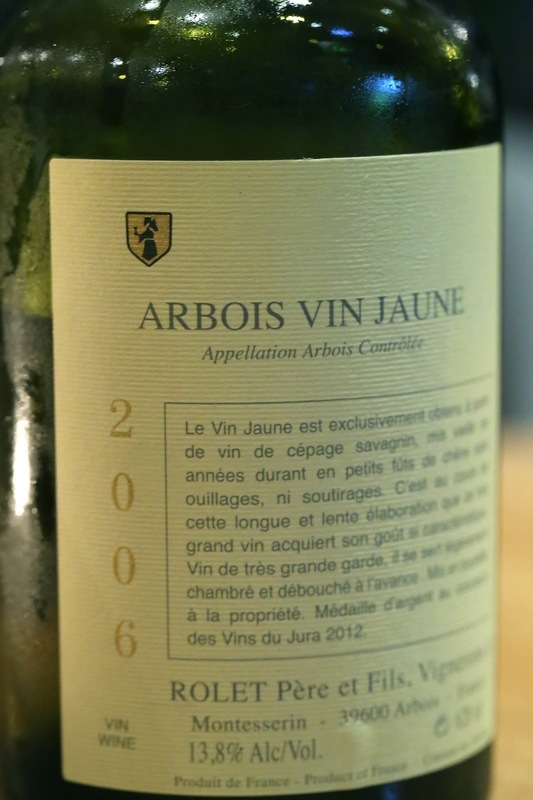 2006 Rolet Arbois Vin Jaune - a little waxy. Nice and oxidized. Naturally this was a perfect accompaniment to the Comté... Many thanks to Giancarlo for the treat.